Larvae are attended by green tree ants, Oecophylla smaragdina. They feed on a variety of plants including the following species on campus, Cassia fistula, Senna alata, Castanospermum australe, Cupaniopsis anacardioides and Planchonia careya. Mature larvae variable in colour and markings which are either bright green with green, orange or reddish bands, or dark reddish-brown with white lines; head greenish-yellow. 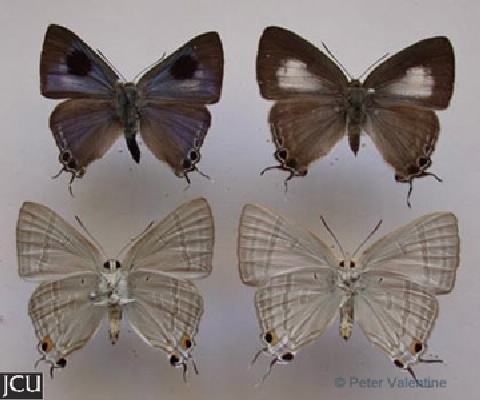 Adults dull black with large blue area enclosing a black patch, in the female also a white area; hind bluish with one or more eyespots near the two black tails; lower surface pale grey with some pale bands and two black spots near the tails.